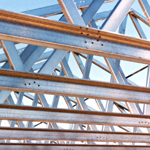 Light gauge steel framing (LGSF) or house framing has seen massive growth over the past decade. The need to build low cost houses and buildings fast means the adoption of new manufacturing methods. The industry has changed from labour intensive welding, blind rivets, self tapping screws, drill screws and structural rivets to using the self pierce rivet process. Self pierce rivets improve the joint quality from a strength and durability aspect, plus they offer a more cost effective solution compared to other processes. As an example for wall frames, the use of pop rivets or self drilling screws or self tapping screws is a two or three stage process. Followed by rotating the frame over and starting the process again. As well as the time factor, large numbers of drill bits and drivers are used and need to be factored into the overall cost equation. Henrob’s new E frame tools allow self pierce rivets to be placed simultaneously on both the top and bottom side of the frame all in one movement and 2 to 4 times faster. The efficiency improvements alone justify the investment. 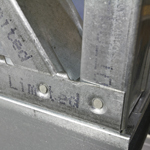 Welding of pre-galvanised frames has become a major Health and Safety issue not to mention the expense of extraction systems to extract weld fumes. It's not just a problem with welding fumes, skill shortages means there are less qualified welders while the durability of frames, particularly transportable buildings is a critical factor when compared to the fatigue resistance of welded and screwed joints. No matter what welding process is used whether it be spot welding, plasma welding, MIG welding and even TIG welding, they are all subject to the same sorts of limitations being the thin galvanised steel and the necessary skills and overall efficiency make welding a poor choice for this application. A large range of products are assembled with SPR in the building industry across the globe. In addition to wall framing, flooring systems and roof trusses, including for high wind regions where hurricanes and cyclones occur, there are kilometres of beams and lintels manufactured. New applications include formwork beams for concrete floor slabs, bracing panels for shear wall bracing, bridging struts used to brace roof purlins and a host of related products. Other fastening methods have been tried including adhesives or fasteners such as a lock bolt or Huck fastener. They have all proven to be more expensive and less efficient to apply. 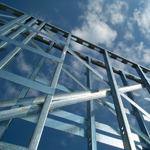 SPR sets the benchmark in light gauge steel framing applications.